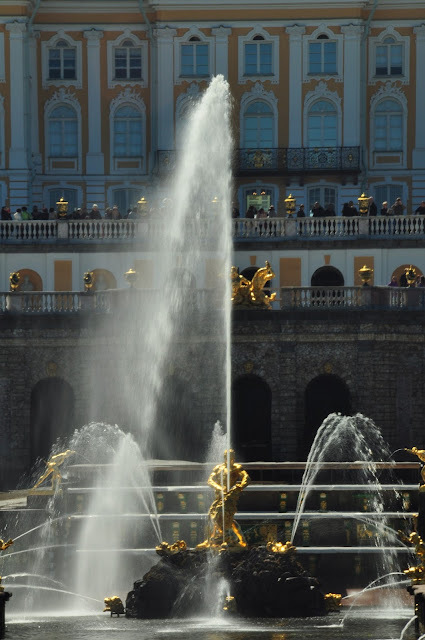 Peterhof Palace and water — they go together. And a lot of people take the water route from St. Petersburg, Russia to the attraction, such as my wife and I did on our recent 9-day cruise of the Baltic Sea capitals. We boarded a hydrofoil in the downtown area for the journey on the River Neva that empties into the Gulf of Finland. On our mid-May journey, we enjoyed clear to partly cloudy skies with temperatures on the cool side (mid 40s at night and low 60s in the day). But I felt it was a little cooler that day on our trip to Peterhof. Or maybe it was the wind. Getting off the hydrofoil at the dock, we experience what I thought was a 25-30 mile per hour wind which chilled my bones. But we journeyed on. My wife was in her transporter and I pushed her the 100 yards or so from the wharf to the main attraction, the Grand Cascade. 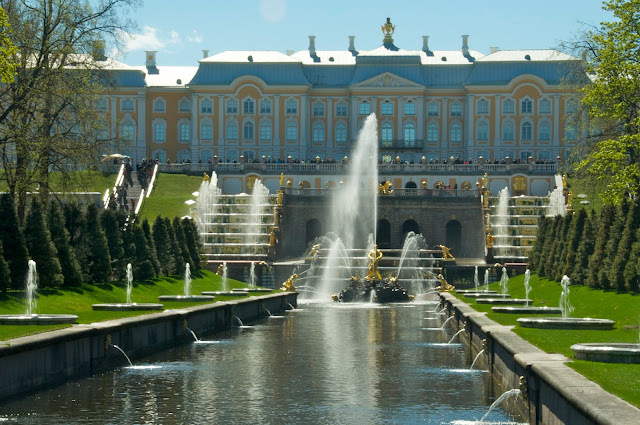 Peter the Great first envisioned what is called the Versailles of the North. It was was founded circa 1714. Reports indicate that Peter wanted to commemorate the victory over Swedish forces in the Northern War that was going on from 1700 to 1721. The battle in 1709 was near Poltava in the Ukraine, and considered the turning point of the war. He therefore dedicated the whole complex of Peterhof to the victory over Karl XII. The facility includes several palaces and three parks with the main attraction being the Lower Park with 150 fountains and four cascades. The lower park is relatively level which makes it easy to walk. But the lower park covers an area some 200 yards wide which makes for a good distance to cover. One of the more unique items was the fact that all the fountains were gravity fed. No pumps are used. Another interesting item was a number of fountains that were activated by visitors either stepping on a rock on the ground or trying to reach for fruit on a table. 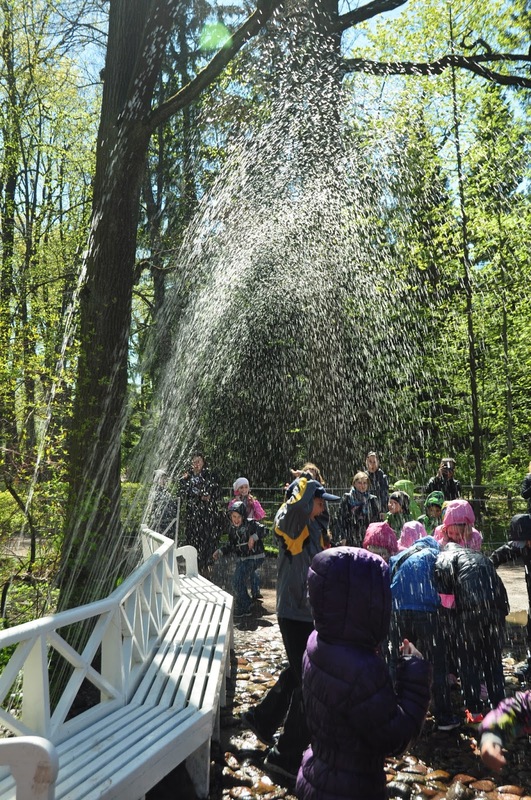 Many visitors get soaked attempting to outsmart the fountains. Our tour of Peterhof and the lower gardens ended with a somewhat strenuous uphill climb to the exit.